Step into this peaceful and private mountain escape, and begin a restorative vacation that will truly! Mysty Mountain Cabin, our flagship rental property and one of the first ever at Stevens Pass, sits on five private acres nestled along the banks of the beautiful Skykomish River, just 15 miles west of the summit. Its popularity endures and grows every year as former guests return for their annual retreat, and new guests discover its magic! This scenic and secluded getaway is ideal for a romantic weekend with a loved one, or a week of recreation and adventure for the whole family. The cozy interior features three bedrooms in a bright, cheery, and spacious cabin atmosphere. Enjoy hardwood floors, a warming wood stove, updated kitchen and open concept space on the main floor. Prepare a meal with your loved ones, enjoy the food, wine and company, then slip into the hydrotherapy hot tub and gaze up at the stars while soothing muscles aching from a day of mountain fun on the slopes! The master bedroom with queen bed is the perfect spot to retire afterwards, to rest up for another adventure. The next morning, sip fresh-brewed coffee, take a cleansing steam in the custom-built sauna with pine ceilings and floors, then shower off and head out for an invigorating hike, or a day trip to nearby Leavenworth - just on the other side of the summit. You could head into Index, WA to embark upon a thrilling white-water rafting trip, swim or float on the inviting Skykomish River, go geocaching, or simply relax and watch the day drift by at your very own mountain oasis. With a large flat screen TV, DVD player, Netflix & streaming apps, and high speed wireless internet, the time will pass enjoyably! Mysty Mountain offers a rustic cabin retreat with modern city-like amenities - the perfect combination for a memorable North Cascades escape. Bonus features: a disc golf basket with frisbees included, and additional deck built right on the river! Book Mysty Mountain Cabin for your next getaway today. This North Cascades vacation rental is professionally managed by Mysty Mountain Properties! We are a small local company that specializes in vacation rental management in the Stevens Pass area, and have been in business for 15 years. Call or email us anytime! We are always happy to help you plan your mountain vacation. Newly remodeled top to bottom, 500 square foot patio, Riverside deck, Riverside hammocks, Large park directly accessible from property. We stayed two nights this summer. With warm temperatures, we were comfortable with the fan provided and open windows. The seclusion was delightful. We never used the hot tub or the sauna, but wanted too. So exhausted after the hiking each day that after dinner we collapsed. The only issue I had was the steep stairs and the tricky light at the top of the landing... otherwise it was ideal. I live on the east side, my best friend lives on the west side. We were looking for a place to meet in the middle for a weekend getaway to unplug from the rat race and reconnect with life. Stumbled on this place by accident at the last minute, and it was perfect! It is small, but clean and organized and had everything we needed. Going this time of year (August) the river was really low so all we did was put our feet in, but access was really easy. The cabin was very clean and cozy. The only thing about the cabin that I haven't seen mentioned elsewhere is that the stairs to second level are steep and tight. Everything else was as advertised and wonderful. Hottub worked great. Grill worked great. We would both go back again. The property is fantastic! Great large lot, quiet, secluded, riverfront very peaceful! The property is fantastic, perfect for family fun and games, and the river experience peaceful, beaurtiful, and restful. Quiet and secluded. The cabin is clean, but much older and worn than the pictures shown. Very steep stairs to bedrooms, harder for older folks. Only one couch, and other chairs not as comfy. We had a mouse on the loose inside, but management came and set up traps next day and it was caught the next evening. Our car wouldn't start the day we left and manager was extremely helpful, even drove us back to Skykomish, and checked in on us later. Good place overall for family fun. Thanks Joe and thanks for staying! The property is great, not perfect, but perfect for what I needed: To UNPLUG. The field was great, having our dog there was great. Having a Hot tub and Sauna was very nice, though they are both a little rough around the edges. There were only 3 of us so the place felt very spacious. I spent an hour this morning sitting in the hammock and watching the river flow. Amy, thank you for staying. We're so glad you had a relaxing getaway. Come back again soon! 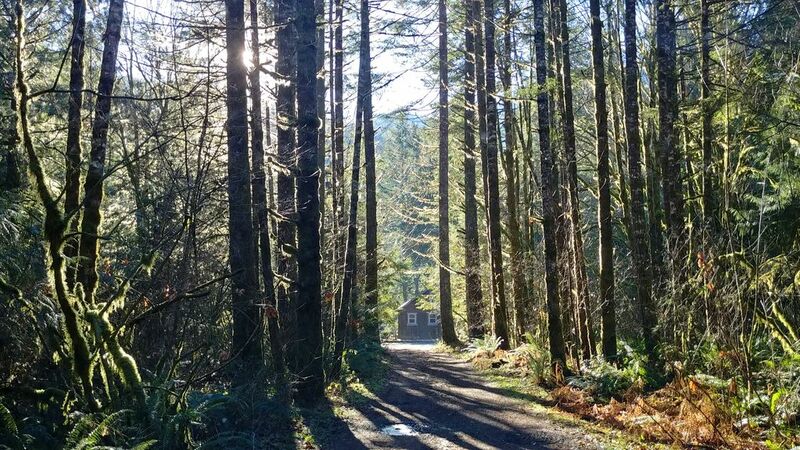 Mysty Mountain Cabin is right on the Skykomish River! All of our properties are either right on the water or have easy waterfront access! $20 per night per pet for up to three pets. 2 night minimum stay required, 3 nights over holidays. Children 2 and under stay free! Include them in the reservation 'comments' field. Up to 3 pets may stay @ $25/pet/night. Contact us if there are more than one! Full payment is due up front for reservations arriving within 30 days. No check ins on Thanksgiving or Christmas; our cleaners have that day off.